How can you add Power BI Tiles & Reports in your Microsoft Excel, PowerPoint Documents or on a SharePoint site? 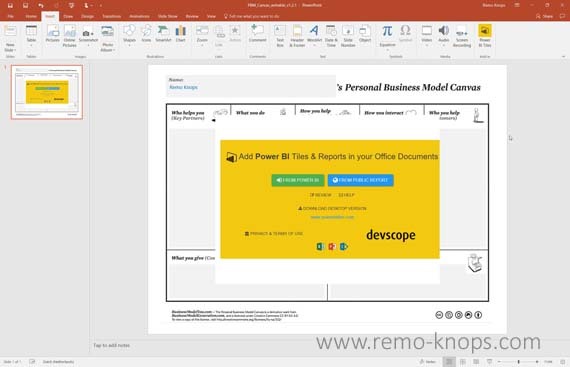 Rui Romano of DevScope has built an application that allows you to insert Power BI visualizations into Office documents. You can get the Power BI Tiles & Reports COM Add-in by clicking the add button in the Office Store or you can search for the plugin from the store button in the ribbon of Microsoft Excel or PowerPoint. On my Microsoft Surface Pro 3 I find the store option in the File tab of the Office Ribbon. The COM Add-in places itself in the Insert tab of the Microsoft Excel or PowerPoint ribbon. After installation of the COM Add-in from the Office store you open Microsoft PowerPoint and go the the Insert Tab of the Office Ribbon. On the right you see the Insert Power BI Tiles button. When you click on it you will get a yellow DevScope Power BI Tiles pop-up window with a few options. I used the first option, which redirects you the the Office 365 login screen. This step does the authentication with Power BI and you need to grant the Power BI Tiles COM Add-in permissions to read your reports in order to insert your visualizations. After the authentication step you can choose the visualizations from your Power BI Dashboard that you would like to share. If you want to add more visualizations you simply add another container via the Insert Power BI Tiles button. Rui Romano has build also a version of the COM Add-in for Microsoft Excel. I’ve tested it and it works exactly the same as described in the above section of Power BI Tiles for Microsoft PowerPoint. While it can be useful in some usage-scenarios (for example when you distribute Excel Workbooks) it can be useful to add a visualization from Power BI. Personally I think that most analysts and data professionals do a lot of their hard reporting and analysis in Microsoft Excel. So I publish tables and simple charts to Power BI using Power BI publisher for Microsoft Excel. But I have the Power BI Tiles COM Add-in for Microsoft Excel installed anyway, so I can do the complete round of exchanging data and visualizations. 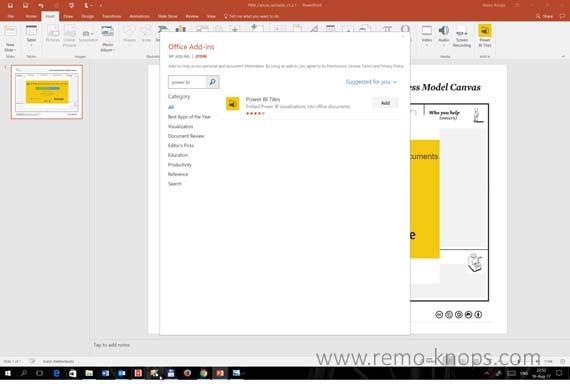 With the Power BI Tiles COM Add-in from DevScope you can add interactive tiles from your Power BI dashboards easily to your Microsoft PowerPoint slides or Microsoft Excel workbook. 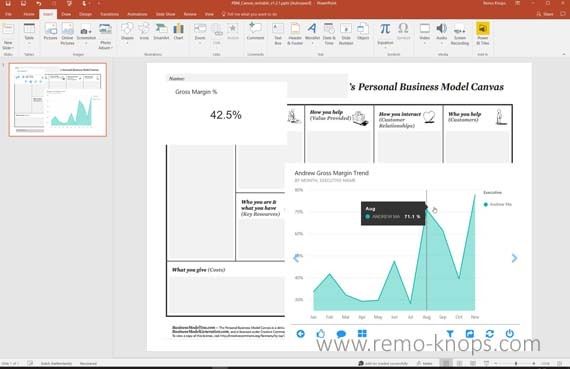 Personally I see the most value in the ability to add Power BI dashboard tiles to a PowerPoint presentation. I often do the hard calculations or data structuring in Microsoft Excel and perform the visualizations in Power BI, or simply publish charts and tables to Power BI with Power BI publisher for Microsoft Excel. This means that I personally don’t use the DevScope Tiles add-in for Excel a lot. Power BI Tiles for SharePoint isn’t free but can be installed from the Office Store for a small fee of $2.99/month. I haven’t tested the Power BI Tiles for SharePoint Add-in. However I can see excellent value if you are collaborating a lot with your team through SharePoint sites. Interested in other software reviews? Check out this page with the software review table. Hey!, I found this information for you: "Add Power BI Tiles in Microsoft Excel, PowerPoint and SharePoint". 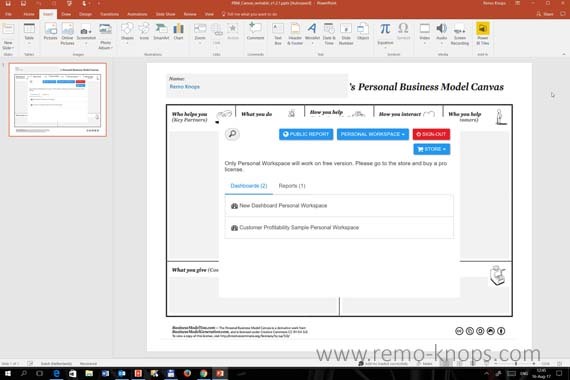 Here is the website link: https://www.remo-knops.com/6915/add-power-bi-tiles-microsoft-excel-powerpoint-sharepoint-devscope/. Thank you.